Via ferrata grades guide & more » Try out our outdoor apps! Via ferratas are a fascinating thing. They allow you to climb steep rock faces with simple securing devices which would otherwise require complicated climbing techniques. Although via ferrata equipment is relatively simple to use and not particularly comprehensive, there are some things to consider. 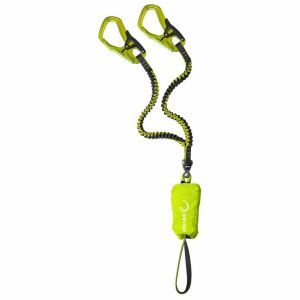 Compared to the climbing equipment for alpine climbing the equipment for via ferrata is relatively cheap. In addition to functional clothing and sturdy hiking boots, all you need is a helmet, a harness and most importantly the via ferrata set. Since you don't need much anyway, you can spend a little extra money to make sure you get exactly the via ferrata equipment you like. Via ferrata - where does the sport come from? Nowadays, every year thousands of mountaineers go searching for fun and recreation along the Alpine iron paths, taking routes of varying degrees of difficulty to the summit. However, the origin of the via ferratas is not so pleasant. The first via ferratas were created in the Dolomites during the First World War in order to supply the soldiers in the mountains with provisions. After the war those via ferratas gradually gained popularity as sporting alpine routes and today they are more popular than ever. Via ferrata equipment has continually improved to provide more security with the growing popularity of the sport. What do I have to bear in mind when buying my via ferrata equipment? As already mentioned, via ferrata equipment consists of a helmet, a harness and a via ferrata set. Many manufacturers offer completes sets for via ferrata beginners. Any conventional climbing helmet can be used for via ferrata. Whether you go for a hardshell helmet, a hybrid helmet or a foam helmet is up to you. The helmets have all the necessary certification and protect your head from bagging against the rocks and against falling stones. In terms of the harness, a sit harness alone is usually used for via ferrata. However, using a full-body harness or a combination of chest harness and sit harness is recommended if you're traveling with a heavy backpack. The harness should fit well and sit comfortably. Many models are adjustable at the hips and legs allowing them to adapt to different layers of clothing. All in all, via ferrata equipment is very flexible. Perhaps the most important piece of via ferrata equipment is the via ferrata set. Modern via ferrata sets have a Y-shaped construction (V-shaped systems and are no longer used and are also no longer available on the market) and consist of two via ferrata carabiners, which are connected to a brake system via lines. A perforated brake plate (older system) or shock absorber (newer system) is usually used for the brake system. Both brake systems ensure that the impact force is reduced in the case of a fall. 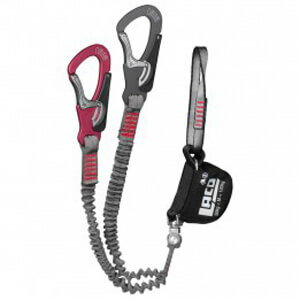 Another development in the field of via ferrata equipment is elastic lanyards. The elastic system provides a large range of motion while climbing and ensures that the lines are close to the body when you're on the move. In this way the Y-arms get in the way a lot less than rigid lines. There's only one thing left to do...grab your gear and head for the mountains! If you're not lucky enough to have the Alps on your doorstep, don't worry. You can even find the odd via ferrata hidden away in the lower mountain ranges.